We're Darien's first community container garden! We started this project, in the spring of 2015, to raise awareness about the troubling food gaps in our community and the many families struggling to access food, especially garden fresh foods on a regular basis. We felt that if we could get the community thinking about food differently and get involved in actually growing the food, that we'd stand a better chance of assisting more families and having a greater impact. Two Tons Done - Season Three is in the books! Since the spring of 2015 we've invited families, identified by area social workers and local food pantries, to grow with us. We've provided all of the materials necessary, as well as the instruction, to get families growing some of their own garden fresh vegetables. In three growing seasons now we've grown, rescued and shared over two tons of garden fresh fruits, vegetables and herbs with our select families as well as local food pantries. Over 2,300 lbs. this season alone! When we say rescue we mean the network of home gardeners that we've established since the summer of 2015. 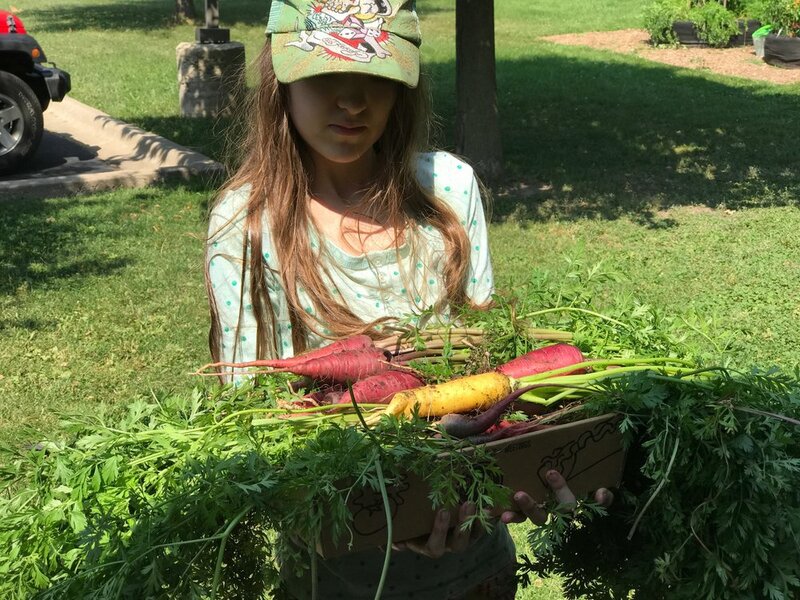 Home gardeners wanting to share their excess yields with our small network of select families - garden yields we've rescued in order to connect them with neighbors who stand to benefit most from having access to them. 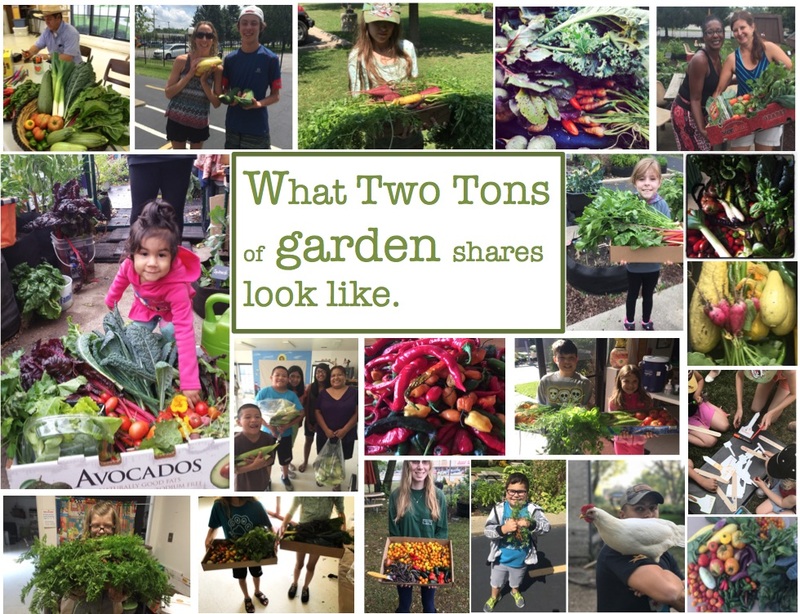 Our Home Gardeners have accounted for nearly half of the garden shares we've distributed to date! We've grown from our original host patch, at Safety Village, that first season to establish nine additional garden patches around our community this year so we can assist more families and introduce our neighbors to the power of growing one's own food. If you would like to get involved please consider clicking on the Volunteer Here Tab in the upper left menu and leave your contact info. We're working to see that hunger has no place here in Darien. As of October 2016, we've shared over ONE TON (2,012 pounds to be exact) of garden fresh vegetables, herbs and fruits with our select families! Proudly proclaiming our garden success on our new JUMBO Chalkboard courtesy of Uncle Jim. Our Sunny Patch Community Container Garden is located on the grounds of Safety Village of Darien (7400 Cass Ave., Darien) Without the Hagens (Cindie and Dave) agreeing to act as the inaugural host location for this project, there probably wouldn't be any Sunny Patch Project - thank you so very much Cindie and Dave for letting us explore how we might best assist our neighbors! The operative word here is container garden - these are not raised beds or in ground garden plots. The soil we used in our Patches was donated by Hinsdale Nursery in Willowbrook! Special thanks to Marlena and the crew there at Hinsdale Nursery! We received some additional soil to complete our Patches from the City of Darien. Tameling's also stepped up to further support our project with some additional mushroom compost, this on top of their initial generous support of over six yards of mulch to prepare our grounds - thank you Dave! In our first season we planted over 68 containers or Patches as we like to refer to them. We also utilized some of the open spaces and experimented with planting some of our winter hardy crops in those spaces. All of the vegetables and fruits grown on the grounds are accessible by the registered families throughout the growing season. The aerated containers or Patches as were calling them are Made in the U.S.A. by High Caliper Growing System in Oklahoma City, OK.
A Special Shout Out and Thank You are in order Here! For Season Two, High Caliper continues to support our project! We recently received another 18 of our Patches (growing containers) from our friends at High Caliper. They're excited about how we're working to expand to open spaces and provide access to more families in the community. Thank you High Caliper Growing System, especially Karen Murphy! A very special thanks to our donors! Please support these businesses and organizations - when we say we couldn't do this project without them, we mean it! The Owano Family - Gary (Greenhouse Construction Team), Susan and Maria and of course - Mary Beth Owano my partner in this work and our Director of Community Outreach-this would not have succeeded without her! C.F. Clark and Assoc./Lisle - special thanks to Susan and Louis Tinucci for their generous in-kind donations to our project. Cindie and Dave Hagen - again, as mentioned above - without access to their beautiful Safety Village grounds, none of this would have been possible. Sam Wasala - our Public Health intern who found any free time over the summer to visit and share research and grant ideas, etc. We are so excited to have her on board with us! There were a number of other volunteers and neighbors who stepped forward to assist throughout the season and we hope you know who you are and we look forward to reconnecting for Season Two! We received support and funding toward the end of our first growing season (fall of 2015 to be exact) from a Darien family, the Sadowski Family. They committed to raising memorial funds in their mother Marie's memory for our Sunny Patch Project. They were especially interested in helping fund the addition of a greenhouse so we could extend our growing season here at the Patch. Above is the tribute we prepared for the greenhouse blessing by Father Gavin Quinn of Our Lady of Mount Carmel. One more way to get involved without ever leaving home! 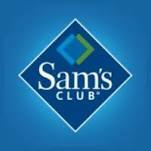 Please consider being a Home Patch Member! SO MANY SIGNING UP !!! This is one of the most popular ways residents are choosing to get involved in our project! We'd love to appeal to any of you who already garden and ask that you consider sharing any leftover garden yields you may have with our Sunny Patch Project. If you'd be willing to register your home garden patch with our project, we'll just need a few details from you and the pinky promise that you'll consider sharing some of your yield when those tomatoes and cucumbers are swinging from the vines! We'll have harvest drop locations later in the season and will make those dates/times available to anyone who registers a Home Patch with our project! If you have any questions about our Sunny Patch Project or care to register your Home Patch - email: goodworxinc@gmail.com or call 630-272-0915.